For the past two weeks, I have been working with an online ESL company called VIPKID (pronounced V-I-P Kid rather than VipKid like I originally thought). 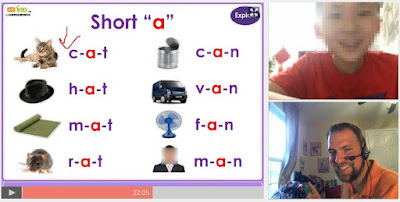 Basically, what I do is teach English to students in China through an online platform, similar to the Google Hangout interface complete with an interactive whiteboard system. I wasn't sure what to expect when I signed up for it, but the following are ten things I have learned. If you're excited to get started, you can skip this post and sign up here. 1. It is truly a plug-and-play experience. After the interview process, which I'll elaborate on later, the whole experience became much easier and meaningful. All of the lessons are already developed, so there is no prep involved on your end. I use the VIPKID app to review the lessons and prior student feedback to get myself mentally prepared. The biggest prep work involves thinking about what props to use in the lesson. A full class session runs 25 minutes, which means you need to be pretty spot on with your pacing (each slideshow is about 25-30 slides long). Once class is over, I immediately leave some feedback for the parents about what their child did and my desire to see the student again, and review for the next class. In total, I'm about to get this all done before my next class begins. 2. Props do not have to break the bank. When I was prepping for my interview process, I saw that the demo videos had a ton of props and I began to worry if it was going to be worth the money if I was spending money on props left and right. Truth be told, I have spent a grand total of $1 on props (a pig in a rocket ship that I found in the clearance section in Walmart). I have Simpsons action figures that I can use to teach about family, for clothing, for he/she/they pronouns, and many other concepts. That pig becomes my "it" pronoun, the prop for the verb "launch", and a piglet in the animal life stages lesson. Look around your house for your kids' toysvip or your classroom. I'm sure you already have tons you can use. I did buy a $15 headset/microphone combo, but iPhone headphones also work. I also made a set of alphabet flashcards on regular index cards. 3. The lesson topics vary widely, which helps keep it interesting. In researching the company, I thought I would just be teaching letter sounds and phonics all the time, but that's been a small part of my work. On a given day, I might be teaching about the phonics of A, B, C, D to one student, about insects to another, and about the moon landing to a third kid. It keeps it fresh to me. This is a big difference from teaching fourth grade. Every year I teach the same content to a different group of kids, often teaching the same mini-lesson to multiple groups of students in different ways. This variety of lessons exposes me to a wide range of discussion topics, which is fun. 4. Teaching from the comfort of your own home is awesome. My teaching "uniform" consists of a polo and pajama pants/shorts. I couldn't get away with that in a regular school, but the kids only see you from the waist up. Some people go crazy in decorating the background, but I just do it in my office in the house. It's great to have a 30 second commute from my bed to work. Everything I need is right there and I find myself getting into a flow. 5. You set your own hours. Originally, I thought I had seen somewhere online that you were required to do a minimum of 15 classes for the company a week. However, there is no minimum. This week, I am doing about thirty classes, but next week I'm only doing six since I will be traveling for most of the week. When I get married later in July and go on our honeymoon, I just won't set the times to "Available." There is no penalty for not being available, but there are some penalties if you say you're available and then change your mind once you are booked. In my case, I am working from 6 am - 10 am everyday (China time is 12 hours ahead of me on the east coast), and plan to do 6 am to 8 am (the time I spent commuting the past two years) when the school year starts. I like that it's in the morning because it gets me up and moving so I don't waste my time sleeping. You can also do evening times, but I'm choosing not to so I have time to relax in summer. 6. The money is a good source of extra income. Obviously, the reason people do extra jobs is to get extra money. First things first, it's not a scam or an MLM company (so you won't be stuck with a ton of extra inventory to try to sell to your friends). You're hired as an independent contractor, paid monthly, and will get a 1099 for taxes at the end of the fiscal year. The money at VIPKID is pretty nice, especially when you consider you don't have to plan, grade, communicate with administration or families, or most of the "extras" involved in classroom teaching. You can make between $7-9 per 25-minute class, along with incentives. (So if they offer you $8 per class, you'll really be making $16 an hour, before incentives.) For example, they give you an extra $1 per finished class and then an additional $1 for every class if you complete over 45 classes in a month. 45 classes in a month sounds daunting, but that's really only about 2 classes every weekday. As of the writing of this post, I have made over $300 in about two weeks, with only teaching a few classes every morning. You also get paid if a kid doesn't show up to a lesson (which is how I had the time to write this post). 7. The most challenging part is interview process, but it's doable. The interview process is probably the most daunting experience. When I did it, I had to do an interview with a person in their Chinese call center, in which I had to teach a ten-minute lesson to a grown woman who was acting like she was five. I really hate doing that. Stick me in front of a real child and I'll show you what I can do. I then had to repeat this process two more times (with 25-minute lessons) to two more full grown people. All in all, I completed the whole process in 48 hours. Along the way, they give you feedback to help improve during the lessons and beyond. That being said, none of my classes have been as hard as the interview process was. Imagine that - real kids are easier to work with than play-acted kids. They have changed the interview process slightly since I was hired, so feel free to reach out for extra info. 8. It's an immersion program, so you don't need to know Chinese. Inevitably, when I tell someone that I'm teaching English to Chinese kids, they say, "Wow! I didn't know you knew Chinese!" Spoiler alert - I don't. VIPKID is an immersion program, so you solely speak English the whole time. One of the only requirements is that you're a native English speaker, so if you can speak English, you can do this job. Using props, pictures, repetition, and gestures help to cement the English words in their mind. 9. Teaching online is way different than teaching in real life. Fourth graders need a lot of explicit direction, lest it turn into a Lord of the Flies situation. In my normal classroom. I give detailed instructions (unless it's a more creative project or something I want them to figure out on their own), review it, and write it up on the board. Not so much with VIPKID. You want to remove all incidental language. "I want you to circle the letter A and say the sound" becomes "Circle A," while holding your hand to your ear. You'll also use a ton of gestures (called TPR - Total Physical Response). While I'm an expressive person, it's hard to make sure I'm remembering to do this always. I try to remember that the lower level the student, the higher my TPR needs to be. 10. The Chinese kids truly want to learn and make your job easy. I've been very fortunate. As of this writing, I've taught about 35 students. 33 of them have been stellar, while 2 have had minor behavior incidents that were easily righted. There is a star system built into the classroom to help reward the kids and I also have a superhero sticker chart to give additional rewards. However, I find I don't need to use these as bribes. They really want to learn and always give it their all. They also show such respect and often will thank me when I give them a star. Many of them can extend beyond their lesson. In a recent lesson about insects, we had a discussion about bee stings and how they're not a fun time. Look for these little moments - they are what make it worth it. It's also really cool to learn firsthand about a different culture from the comfort of my own home. Interested in becoming a VIPKID teacher? So does this sound like something you'd like to do over the summer or in the mornings/evenings during the school year? I really have yet to see a major downside from working with them. The only requirements are that you are a native English speaker, hold a Bachelor's degree, and have classroom teaching experience. If you'd like to sign up, you can do so here with my referral link. If you have any further questions, feel free to email me or ask me in the comments below. I'm a sucker for puns. 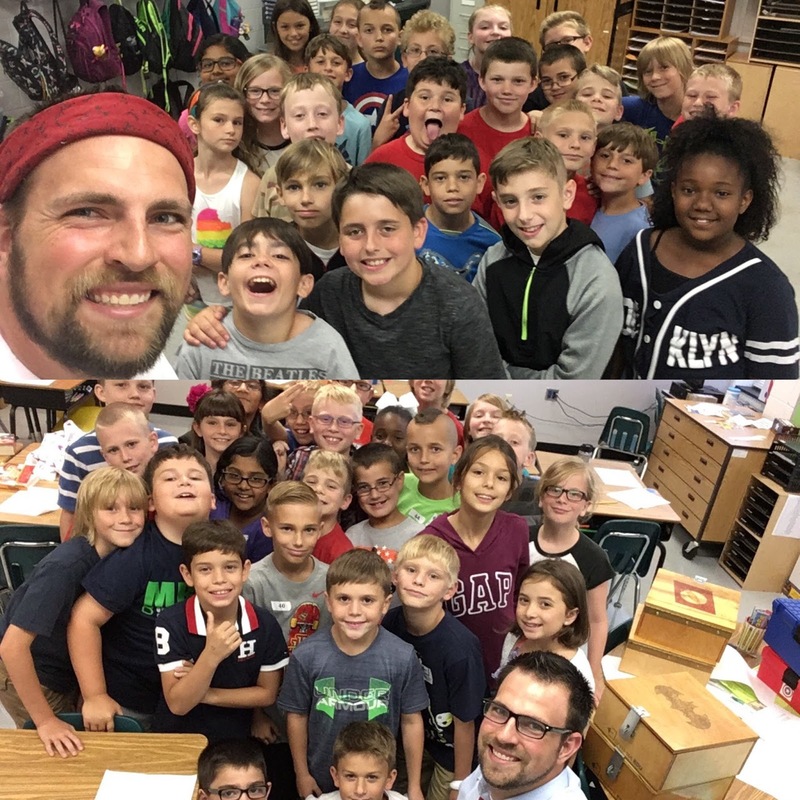 My "goals" post for my fourth year of teaching in 2016-17 was called "Going Fourth Into a New Adventure" and now I'm laying down "One Four the Books." Go ahead, you may groan. I'll wait four it. At least I had the four-sight to warn you. My "One Word" for 2016-17 was REFINE. However, in mid-October, that word changed to CANCER. I had (and beat) cancer this year. I was out of the classroom for three months, which made many of these goals hard to meet. To be honest, I fell short on nearly all of these goals. I did not amp up 20Time. It basically was an independent research project again. I started daily vlogging, until October when my life basically fell apart. I tried to get back into it after returning to work, but never found my flow. Student-led learning and my instructional/assessment practices did improve, but not to the degree I wanted them to. I started strong with growth mindset and it remained a theme throughout the whole year. I would say that is the only goal I fully met that I had set for myself. I didn't get to try too many new things either. Among the few new ideas were some new review games, continual tweaking of Choose Your Own Adventure experiences (read about first method, second iteration, and student-created versions here,) using Autocrat for communicating digital assessment results home, an emphasis on number talks, revamping Reader's Cafe, and some other ideas I never wrote about. Maybe it seems like a lot of new things, but to me, I feel like I could have tried something more. Am I disappointed? Maybe a little. Those were important goals to me back in September, but new opportunities arose from facing cancer (not something you'd expect to hear from a cancer survivor). I got to model resiliency, grit, and a real-life example of growth mindset. I had a perfect example of sharing vulnerability and honesty with my students. They're now prepared to realize that cancer is not always a death sentence. It helped me build strong relationships with my students, stronger than they would have been without having time solely dedicated to writing back and forth to them every day as I went through chemo treatments. In this post on Dave Burgess's blog, I share about how I learned new things about my students and their lives. I wasn't concerned with their academic growth at that time; I wanted to get to know them deeper as young people. When I returned, I was able to keep these bonds going, but not to the depth I could do then. My end-of-year evaluation from my principal said, "Mr. Birckbichler had a school year that would best be characterized as one he will never forget," which is certainly an understatement. I'm honestly not sure how I feel about this year. My state test score pass rates were the best I've ever had, and their growth from third to fourth grade was similar in regards to other years. Pass rates have never been important to me, but it's always worth noting that according to the state, I was proficient in my teaching. Growth has always been the metric in which I measure myself in, and I'm pleased to see that I met that goal this year. One thing I did much better was achieving balance between personal and professional life. Cancer taught me many lessons and chief among them was to focus on my personal life before teaching. If I'm not taking care of me, I can't take care of them. I made a conscious decision to not work on school work after school. I went in an hour earlier than normal, and once I left the building, it stayed there until morning. Occasionally, on a Sunday, I would work on lesson ideas, but only if it was something that truly inspired me. Towards the beginning of my diagnosis, I made the decision let go of many side projects I had been working on, such as the EduRoadTrip podcast, Breakout EDU Digital, and others, to focus on my health. After finishing chemo and being found in remission, I decided to make that choice permanent. While these were fun projects and I enjoyed working on them, they took up a great deal of time - time I could better spend focusing on my personal life or my students. If it wasn't something that had a direct benefit to my classroom or to my own life, I let it go. While this may come off as a selfish statement, I think teachers (especially those on Twitter) have a huge tendency to overcommit themselves to projects that ultimately won't have a meaningful impact. These were my first steps in a concrete plan to be less busy. Next year, I'll be teaching fourth grade again, but at a new school. While this is two classroom changes two years in a row, it's important for me to be closer to home. My school was amazingly supportive of my medical leave and I am forever grateful for that. However, part of my goal with buying a house was to have a shorter commute, but I ended up with a longer one (curse you, I-95). My new school next year is 8 minutes from my house, and I passed it every day on my way to chemo. It seemed like a sign I needed to be there. I know I referenced cancer multiple times in this post, but it really defined my year and will continue to have a large impact on my life going forward. I try to keep my identity as a cancer survivor on a separate blog (A Ballsy Sense of Tumor, which I highly recommend reading and sharing with the men in your life) but for a reflection post, I couldn't ignore the elephant in the room. It had a large impact on me, and changed my outlook a great deal. So what's the plan for year five? I have no idea as of this writing. My wedding is in less than a month, followed by a honeymoon to Hawaii for some much needed relaxation time (even though I missed three months of work, it certainly wasn't relaxing). I just had another set of scans and I'm still cancer-free. Next year is far from my mind. I know I will make the commitment to maintain a balance and set goals, but right now, I am perfectly happy to embrace the end of the year and the start of summer, just as my four-fathers would have wanted (ok, I lied and this is the last bad pun). “Eating and reading are two pleasures that combine admirably." Two years ago, my class hosted a Reader's Cafe. You can read the full blog post here (and you really should or you might be lost in this post), but to summarize, my students chose and practiced reading three books, wrote varying levels of comprehension questions for each books, selected and rehearsed the jobs of host, waiter, chef, and busperson, and ran the Cafe for the whole school. We didn't get to host a Cafe last year, due to state testing lasting until the last week of school, but this year we had two weeks between the end of testing and the end of the year. Rather than filling this with movies, kickball games, and other time wasters, we decided to host the Cafe. This year, we made some changes from the original plan. The basic structure and jobs stayed the same, but these changes helped to improve the experience. I introduced the Cafe model to my class with a written slideshow and verbally explaining it. I didn't have many pictures from when I first did it with my student teaching class, so I had no real visuals to show them. Introducing it this year was significantly easier than last time. I showed them the recap video that we made after the 2015 Cafe and fielded questions afterwards. 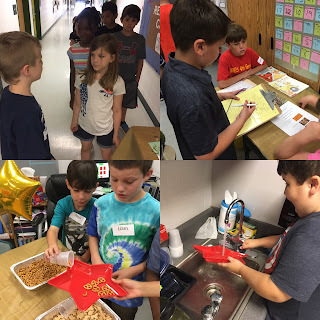 We still followed the same steps in preparing - choosing books and writing questions first, practice reading the books, explain and pick jobs, and rehearse the whole thing. 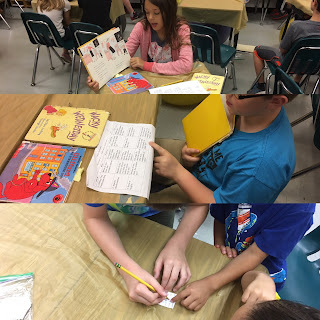 Students developed comprehension questions, including a mix of literal and inferential questions for each book - one before reading, two during, and one after. They then typed these questions into a Google Doc, which led to a number of formatting issues. Students still developed questions, but this year, I used Autocrat to generate the question charts and menus. Students typed their book titles, authors, and questions into a Google Form, and Autocrat used the info to generate the question charts (and even the menus). Eight families attended the 2015 Cafe and had very little interaction beyond that. This year, we had much more support from the families. 26 of 29 students had a family member visit, which was a huge uptick from the eight families who came last time. The parents also got more involved this year. They offered to donate money for food and supplies. One of their parents works in the building and saw that I chose gold as my theme color for this year (I had some leftover supplies from my little sister's Gold Award ceremony). When I came in the next morning, I was greeted with 30 gold streamers, a bag of gold confetti, six star balloons, and four balloons that spelled out READ. I placed these balloons in the hall, which helped hype up the whole school. Feedback for readers was non-existent. The biggest change in the Cafe didn't come from my own work - it came from a student. The Friday before we were to begin presenting to various classes for some practice rounds, a student came to me with an idea. He asked, "Mr. B, wouldn't it be cool if our customers had a way to review our reading so we knew what to improve?" I love student agency in their learning. I said to him, "I like it. Work up a prototype and let's talk on Monday." Once I had explained what a prototype was, he was up for the challenge. Come Monday morning, he walked in with a sketch. He wanted customers to evaluate the readers on overall performance, fluency, and expression (which aligned to the oral reading goals for this project). We worked together to polish it and considered logistics. He decided that each reader would give one feedback slip to the people he was reading to and they would agree on their assessment. This student also developed an evaluation slip for the teacher to complete with their class when they returned, with more of a focus on our performance in the Cafe. Of the teachers who responded, we ended up with 15 positive reviews for the hosts, 13 positive reviews for the waiters, 14 positive reviews for the buspeople, and 11 positive reviews for the chefs. "I really enjoyed the Readers Café experience. It was so awesome to see how much [Student] has grown. I am very proud of him in many ways and I attribute a huge part of his growth to your teaching style and support. He seemed to just blossom upon your return [from medical leave]." My former school had roughly 500 students, in about 25 classes. We were able to fit all of our rotations in two and a half days, with five minute transition times between classes. These times soon became chaotic as we waited on different classes. Both the hosts and the waiters dismissed the customers, which was overkill. This school is over 900 and over 35 classes in total. We had to modify our timing and increase to three full days to accommodate nearly double the amount of customers. Rather than having a 5 minute rotation time, my students had 30 seconds. This actually was a huge blessing. Students had no time to get off task between rounds and helped the whole experience flow much more smoothly. Additionally, the hosts would help get the next class ready as the waiters did the dismissing. This helped give everyone something to do, as the chefs would be refilling the food and the buspeople finished washing and drying dishes. This year's Cafe was even more successful than the 2015 one. The feedback slip really helped to tie it all together. Our final tallies are below, along with the promo video we produced afterwards. I look forward to continually tweaking the Cafe model to be even better in the future. I'd like to hand over the logistics (timing, amount of food to buy, etc) of the Cafe to the students, which would add a level of math integration to it. On Twitter, I saw someone had adapted it for a Math Cafe model and I am interested in that. Perhaps I'll do a Math Cafe before winter break and continue with Reader's Cafe at the end of the year. Stay tuned to find out! "I'm still a kid inside, and adventure is adventure wherever you find it." A personal favorite activity this year has been using Choose Your Own Adventure stories that go beyond the point and click variety. I first tried a method with Google Slides during my medical leave (detailed here) and then stepped it up to the next level by using Google Forms (explained here in my guest post on the EdTechTeam blog). It's fun to make them and read their arguments, but ultimately students are still consuming the material more so than creating. I wanted to take it further - my students would build their own Choose Your Own Adventure story in Google Forms. My students have never created any Google Forms and their exposure is limited to using the ones I've created for them. For this reason, I decided they would first map out their storylines on paper and then transfer it to the Google Form. Fixing the template. Yes, my desk is a disaster. Be intentional with your word choice. Sometimes I would say, "Finish this section with two choices." Some took this as "You can have pizza or chicken and the pizza can be cheese or pepperoni." Technically, this is two choices. I shifted to saying, "Give a choice with two options." Physically pointing on the template was a giant help to some students. I would point at one column and say, "This can go here or here. What choices would make sense in your story?" A few students found it helpful to list all of their choices options first, and then go back to fill in the details in the story. If they chose this, I encouraged them to put the options on the top of the grid for that template. Sometimes, students benefited from just starting over entirely. Keep plenty of extra copies on hand. Some students needed more guidance than others, and that's totally ok. While some grasped the branching immediately, others didn't. A few students wanted to just write a linear story, while others were making choices and neglecting other paths. I worked with them to understand it for the first few steps and gradually pulled back the scaffolds. On my side of things, the template definitely needed work. The cool thing was I was able to modify the template as the students went along, incorporating their feedback immediately. For example, originally the template just had a bunch of boxes with designated sections it would correspond to on the Form. I realized more directions were needed. One of my students helped me make these changes, including typing more clear directions (such as, "Start with option 1 from section above" and "End with two options") and simple formatting. The final completed template can be accessed at this Force Copy link. Students will delete sections, and the proper branching along with it. Generally speaking, they could figure out where to relink it by consulting the template, but they needed to learn how to do that first. Overall, they picked up on Forms very quickly, which is awesome because some adults struggle with it. They loved adding pictures and it led to a good conversation about copyright and using the images Google provides right in the search tool in Forms. Again, this template needed work on my part. Originally, the section titles said "Choice 1, Choice 2, End of Path 1, etc" since I just modified the template I used. I realized that I needed to match it to what their template said, so I replaced them with S1, S2, etc. This didn't help students who had already made a copy of the Form template, but helped other students after I made this change. One student made the suggestion to replace the S1 with "You chose..." as a way to make the story more cohesive. I really thought this was a good idea and many of the students went back to edit to reflect this idea. When they were all done, I had them submit their hyperlink, their name, and title of the story on a Google Form. I used the =HYPERLINK and =IMPORTRANGE formulas in Sheets to make a master list of all completed games for students to try each other's stories (viewable here). This was the really cool part. I saw students paired up doing each other's Forms and giving feedback as they traveled through the story paths. The "player" caught mistakes like incorrect title formatting, misspellings, unclear paths, improperly linked choices, or other things and the "builder" would open their copy to edit for changes. It essentially removed me from the feedback loop, and I am 100% ok with that. Peer feedback is crucial and critical to growing as a creator. How long did this all take? When all is said and done, students had a maximum of two and a half mornings to work on it, or roughly four to five hours. We're at the end of our school year and had some end-of-year assessments and projects to finish. Rather than defaulting to the "Free Read" when they were done, this was the "Fast Finisher" work. It's a really good idea for this because once a few students are done, they have more to explore on by completing other's adventures. In my class of 29, if everyone created a Form with 16 possible outcomes, there would be a total of 464 different variations before students completed all of them. This was just the first experience and I know further iteration is needed. Next year, I plan to delve into this more and earlier in the year. I think it can be a really incredible for experience for the students and get them thinking in different ways. I definitely saw students being pushed and strive to improve their craft, which is awesome when you consider we were at the end of the school year. How can you implement this in your classroom? What modifications would you make?